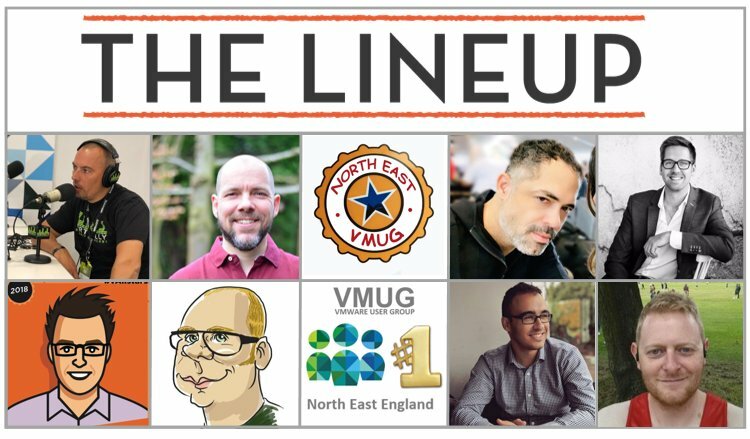 I think its almost irrefutable but the first North East England VMware User Group of 2109 held on the 7th of feb has not only the best line up its had but perhaps one of the best line ups from a regional VMUG ever. My opinion obviously, but just look below. My fellow NEVMUG leader Alan Burns has done a great job describing the agenda here so I’m not going to spell it out for you but having Duncan Epping, Frank Denneman, Rawlinson Rivera, Kev JohnsonKev Johnson, Chris Lewis, Gareth Edwards, Jorge de la CruzJorge de la Cruz and Gijsbert Janssen van Doorn is just amazing!! I think we have a great mix of community, sponsor, and ‘celebrity’ VMware speakers that wont only give you great opportunity to learn but also give you a chance to get some books signed and some selfies. I know us VMUG leaders always seem to be promoting and asking for you to register when the reality is you could leave registration to the last min or even just rock up on the day. We love people who just turn up, but, registration really helps us out. It may seem simple, but all VMUG leadership teams sacrifice time and effort to make these events happen. Including everything from seating, food, drinks, sponsors, session planning etc etc etc needs doing for every event. By registering you really help us out because it allows us to make sure all the preparations are in place for the right number of people. i.e. if the NEVMUG got more that 120 folks wanting to come we would have to switch venue. Or if we had a low turn out we could use the money we would have spent on food, seating etc on more prizes or for a future event. So PLEASE register today if you think there is a possibility in you coming along. I look forward to seeing you there on the 7th. The next North East VMware User Group meeting will be on the 26th of November. Zerto are speaking about ensuring IT availability. Lee Dilworth is speaking about SRM across stretched clusters, a subject that im very interested in at the moment. I love community presentations, its what the VMUG is all bout, and we have Nick Evans talking about a real world Zerto deployment by a REAL North East company. Nimble are a NE VMUG favourite sponsor and are back again speaking to us consolidating to their hybrid array. Michael Armstrong is talking NSX. For anyone who knows Michael this will be a great session as there isnt much he doesn’t know about NSX. Andy Ferguson is giving us another community presentation is talking about the benefits of automation in the real world. We also have a pretty cool set of giveaways. Please check out the VMUG page and register as early as you can. It will be great to see you there. We’ve been busy behind the scenes planning the next VMUG and decided to have a mini VMUG meeting in September. As this is a community group, we’d like to extend the planning to all our members so you have a part in shaping the next event. Why are we doing this, well we want your participation to make the North East VMUG the best it can be. Those regular attendees to VMUGs across the world may be a little surprised to hear that its often difficult for some people to get their companies to sign off on their employees attendance to a VMUG. Its not something I came across as a regular attendee to the London VMUG but when I moved back to the North East and started attending, and then leading, the VMUG up here in Newcastle I noticed it was difficult for people to attend due to company policy or IT manager perceptions. I know there are quite large cultural differences between regions and countries and I suspect that’s what’s happening here. It transpires that in the eyes of some companies, especially in the the North East, that events like the VMUG are viewed as a ‘Jolly’ and they are giving their employee a paid day off to enjoy themselves and get drunk. To a lesser extreme its viewed as ‘personal development’ and not of value to the company the employee works for. In fact I was surprised to hear that a good number of people at the last event had to take the day as annual leave from their employer. And a few couldn’t attend as they were denied permission to even take a days leave. Ill get this out the way now, YES, we go for beers (and food) after the event. And YES this is complementary. YES, there is also a raffle where someone could win a cool price like a tablet or other cool gadgets. 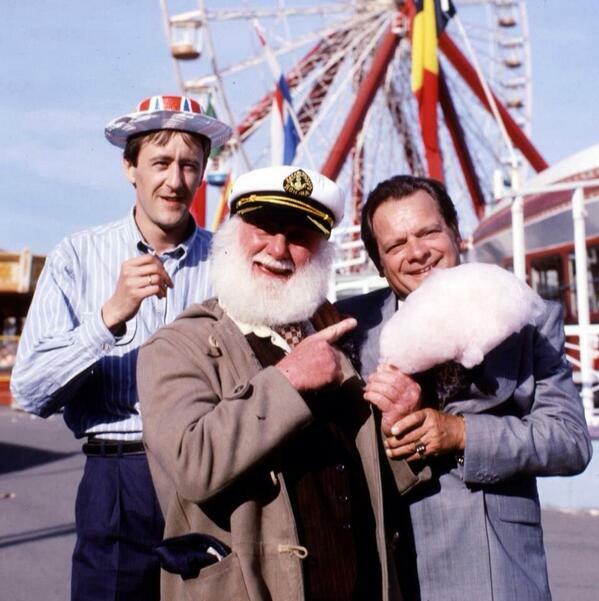 THIS IS NOT A JOLLY……..
Its a long old day listening to presentations and networking. As a leader I’m exhausted the next day and I know its the same for the attendees. Not every presentation is relevant to everyone. We try and make it as broad as possible to everyone benefits but there may be an hour when its a slog. All VMUGs are packed with educational presentations on technology and disciplines that are relevant to nearly everyone that attends. Not only that but they are relevant to the companies they work for. Gaining knowledge on how others have approached similar problem and projects could prove critical to your companies IT transformation or resolving issues your currently having. Product research and analysis. Sponsors bring a wealth of information and resource with them. While its no VMworld Solution exchange there are stands and plenty of opportunity to do some research on tech other than VMwares. Networking with industry experts. There are ALWAYS top guys from VMware present at these events. And while that’s great the BEST thing is that top guys from the wider industry attend also. I cant stress enough how much in one day of talking to an industry expert how much someone can be inspired to go back to their place of work with a new outlook on their IT strategy and also on life. New Sales Connections. As with any event, sales guys from all sorts of companies (vendors and partners) are looking to make new connections with customers. Unlike getting a cold call about your PPI these guys are industry specific and can actually offer you great information and may be able to help open you up to technologies or techniques you previously had not considered. If your an IT manager or Team Leader and one of your guys asks if they can attend a VMUG PLEASE let them take the day to attend. The benefits to your company will far out way the time they spend out of the office. Well its been a little while and LOADS of virtual water has passed under the Tyne bridge. But, after 6 months we are finally back on with the next North East England VMUG. May 21 isn’t all that far away so make sure you get the time booked in at work for this now. There are may reasons employers should send allow staff to attend VMUGs and such like events without making people take paid leave but however you need to get the time to attend, make sure you book now. For those that attended the last event, the fantastic Centre for Life is again the venue for the next event. Im sure you agree this was a fantastic place to get some great presentations and network (while being pretty close to the pub) so im delighted we back again. Id like to welcome Alan Burns to the leadership team. Alan has been a regular attendee at the NE VMUG for years now and his input to the leadership team will prove invaluable. No VMUG would be worth attending if it wasn’t for the community presenters and sponsors taking about technology and their experiences. And to back that up, We have a OUTSTANDING line up for attendees. Our very own NEVMUG leader Duncan Simpson will be presenting on some of his experiances. Adding him own community contribution will be James Rankin. Presenting is tough at the best of times, but presenting to a audience of you peers is nerve racking and these guys are volunteers. I need more guys like these to step up and present at a VMUG (preferably the NE) so if your reading this PLEASE get in touch and volunteer. This time round Tegile make their first sponsorship of the NE VMUG as gold sponsors and we welcome back 10Zig as silver sponsors. From VMware we have Dave Hill talking vCloud Hybrid Services. Dave is a fellow NE guy who is now a US guy but is over for his ‘Vacation’ but has kindly agreed to take some time out from the family and come talk to us. We also have the esteemed Mike Laverick back with us who is now MR EVO:RAIL. I feel this subject will be close the hearts of lots of people in the NE as its a great fit for many use cases up here. So who better to hear it from than the horses mouth. Im sure Mike will also be covering his new VMUG wiki idea which will hopefully take the world by storm. And for the folk that haven’t had a chance to keep up with things, Michael Armstrong will be doing a 45 min round up of the top new announcement and features from VMware. We have so TOP customer presentations. IMO these are the main value of the VMUG and we have 2 great guys in Dave Thomas and our own Alan Burns presenting. PLEASE, PLEASE register early for the VMUG. Its really important we get an idea on numbers. Even if you not sure of you can make it, do register anyway and don’t leave it until the last minute. I look forward to see you on May 21st. Don’t hesitate to get in touch should you have any questions. November 18th sees this years UK VMware User Group. Last year I was so impressed at the scale that the UK VMUG has grown to compared from the very first one I attended a few years back. Hats of to the leaders (who also run the London VMUG) as they do an amazing job. I know first hand how difficult and time consuming it is for the leadership team to organise these events, added that this is their free time and I thank them so much and they deserve a shout out. The agenda, as ever, is jammed packed with sponsor/vendor sessions and community real world experiences. Please do support the community guys who are speaking as they don’t have to share their thoughts and experiences in this forum but choose to. And more often than not the real world experiences are by far the most impactful for the audience. Duncan Epping – Duncan is going over whats coming in vSphere 6. Frank Denneman – If you havnt seen PernixData yet, this is the session for you. Franks a great presenter and PernixData will be a force to be reckoned with in the not so distant future. Hugo Phan – Ive crossed paths with Hugo a number of times over the years and his insights into the hyper-converged will be very interesting. Joe Bagley – VMware CTO in the “ask the CTO anything” Joes has a amazing grasp on the industry and spends his time seeing every customer under the Sun. Hes open and honest and you will get allot out of this especially if your thinking IT Transformation. Lee Dilworth – Talking Availability Updates & Tech Preview. Some cool things coming in vSphere 6 (still under NDA so cant say to much). Dave Hill – vCloud Air is undergoing some changes and its evolving quickly. Take the opportunity to pick his brains. Jonathan Mead – Mr Script is talking vCO. Chris Wahl – It wont be to often you get to attend something by this guy. Its safe to say hes clued up and his talk on Networking will be a very insightful session. Simon Seagrave – GREAT to see Simon back at the User groups (ive been out of the London VMUG scene for a while) so can wait to see him. MANY MANY more great names and presenters that you will get a unique opportunity to no only benefit from their session but also get to interact with. Make sure register if you plan to attend and ill see you there. OH, I almost forgot the Solution Exchange. This is just like a mini VMworld and if you need a break from your sessions or are just looking for free stuff then defiantly hit the vendors stands. Well 2014 has continued at the same momentum as the back end of 2013 for me. A slightly slower pace would be nice but as they say ‘its better to be busy than bored’. But if like me you want to get out of the rat race for a day and come and learn some cool tech and experiences from the community then defiantly come along to the North East England VMUG. This is my first VMUG on the leadership team and you will also get the pleasure (more likely displeasure) of my voice as MC for the day. Also for the first time we have a round table session before the main show. For those that have attended the London VMUG these have proved hugely popular down south and having a community discussion really gives you a knowledge of where the industry is at and what innovative things people are doing. There’s no specific topic so we will just chew the fat on what is hot right now and has the communities interest. It would be great to have a big crowd there for this event and show the North East is as eager to participate in the community as the rest of the country. There will also be some top speakers with Lee Dilworth and Hani El-Qasem speaking along with Michael Armstrong covering some great topics. So come Join us on the 13th of March at the CastleGate for a great day. A big thanks to Nimble Storage and 10Zig for sponsoring the event. I’ve been meaning to post this for a week or so no but the day job has gotten in the way yet again. I’m happy to announce that I have been accepted onto the leadership team of the North East VMUG. When Michael Armstrong (@m80arm – http://www.m80arm.co.uk/) joined VMware it left a position on the leadership team which I promptly applied for. I did think that working for VCE may cause an issue but as long as there is a customer/non-partner on the leadership team its fine for me to be involved. As many of you might be aware (as if you know me you probably meet me there), I have been a regular attendee of VMUGs since about 2008, mainly the London VMUG (when I used to live in the warmer climate of Bournemouth). Since I moved back to the North East I have been a regular attendee of the North East England VMUG which has been gaining in popularity. Being on the leadership team is great for me on a personal level, it allows me to combine 2 things that I’m very passionate about, the North East of England and Innovative cool technologies. I have a few ideas that I will put to the rest of the leadership team but my main goal is to spread the word about VMware and its affiliated technologies to the North East. I get the same feeling about the North East VMUG as I did back in the early days of the London VMUG. Tons of potential and the people involved that can turn that potential into a reality. I’m still to learn what exactly is involved but im very much looking forward to providing my services to make this VMUG the best it can be. Its fair to say its been a while since I have posed anything on my blog. However, this will be changing!! I have decided to make time and get back into the community as much as I can. VMUGs are an awesome way of not only gaining some useful information but are a great incentive to be active in the community, and you meet some cool peeps. On the 3rd of October I will be speaking at the North East VMUG for the first time. As I have been revising for some certs recently I thought VMware certification would be a good topic to cover. VMware certification has come along way since I first became a VCP (way back in 2008 now,im getting old) and with the latest announcements around the new Associate qualifications there is a wealth of levels you can now cover. As im pursuing my VCDX currently (fairly early in the process) I thought it might also be fun to have a little interactive session with the audience, a mini defense task perhaps. The person I think did best job will get a copy of John Arrasjids (and others) VCDX Boot Camp book. As you can see the line up is awesome (well, ignoring me obviously), so im sure it will time well spent. If you are North East based and can make the 3rd please do come along. I’m often asked what virtualisation knowledge level people should have to attend one of the VMware user groups. The answer is ANYONE can attend, from just someone that has a interest in virtualisation and wants to broaden there knowledge to your seasoned virtualisation specialist. To be honest you will get something out of the day even if you are just a general techy and have never seen virtualisation before. The great thing about the London VMUG is that it has now become a mature event and can attract some pretty famous names in the community, and its free . I highly recommend you attend if you can.